UTV and ATV riders, occasionally, experience challenges on the road. At times, this means crossing a muddy hole that is very deep, crawling over large rocks. Also, your vehicle may break down forcing you to pull it to the garage. Generally, your vehicle may get stuck in a place where your driving skills can’t get you out. Thus, you should travel with a friend to help you in case your vehicle gets stuck and invest in a winch or other towing accessories. That will save you the frustration and an aching back. 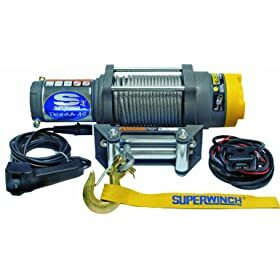 Are you shopping for a winch? We have tested and reviewed three of the best winches on the market today. Also, we have included details on each winch to help you make a decision before the next off-road adventure. For inexperienced buyer. If you are buying a winch for the first time, you certainly need a winch mounting kit. You should ensure the particular kit fits in the model and make of your ATV or side by side. You will likely spend about ~ $30 to ~ $150 depending on the kit brand. Now proceed to check our pick. These winches offer quality performance when your vehicle gets stuck. The Superwinch Terra offers versatility, high-end power and durability need for most side by side ATV or UTV users. It is a serious workhorse that possesses a premium all-steel three-stage planetary gear train featuring machined-in, a 4,500-pull rating, oil pocket bronze bearings, and a 1.6 HP low-amp draw engine. Also, the package comes with a four-way roller fairlead, 55-feet of durable 1/4 inches steel wire rope and multiple operations switching operation. This winch is designed with toughest situations and terrains in mind. It promises to haul your vehicle in any tight spot. The Terra 45 fits virtually any UTV you ride since it’s compatible with most 4-bolt ATV winch mounting kits. Unlike planetary gears in the competing brands, the Terra 45 is a rugged all-steel gear twice as wide as the competitor winches. Safety is a vital consideration in all superwinch products. The Terra 45 has a wealth of invaluable safety features standard. These consist dynamic braking and mechanical load holding to minimize possibilities of wire rope slippage in the case of surge or power failure, and to offer a fast stopping of the drum. A circuit breaker and sealed solenoid ensure safe, dependable, electromagnetic power in all weather conditions. A rubberized remote switch featuring a ten-foot extension cable allows for safe positioning and distances between the winch and user during off vehicle use. Are in search of a durable heavy duty, durable and versatile winch? The Superwinch Terra 35 may be all that you need. This winch is perfect for those who travel to harsh terrains. Also, if your vehicle may is not able to handle thick mud, snow or large rocks, you should travel with a winch because a trip to the woods is unpredictable. Regardless of your vehicle model, the Terra 35 offers quality performance. It is compatible with almost all 4-bolt pattern ATV winch mounting kits on the market today. It is a high-performance ATV winch. This winch comes with 3,500 L-B line pull rating through 50-feet of 13/64 inches steel wire rope. A 1.6 HP low-amp draw engine and heavy-duty all-metal three-stage planetary gear train are a part of this winch. Thus, it delivers enough power to haul your vehicle from any tight spot. It can haul trucks, tractors, and other utility vehicles from the worst situations. Safety is a priority in the Superwinch Terra 35. It includes a dynamic braking system to offer a quick stopping of the drum. Mechanical load holding reduces chances of wire rope slippage in the case of surge and power failure. Also, the 10-foot extension cable offers a safe distance between you and the winch. The package includes a mounting plate, roller fairlead, handheld remote and handlebar mount toggle. The steel drum is meant for use with either synthetic and cable rope. When your vehicle gets stuck, you require high-efficiency ATV winching power. The Superwinch Terra 25 is a great winch that will deliver the required power. It has numerous features that you require hauling your vehicle from a deep pit, muddy roads and other tough terrains. 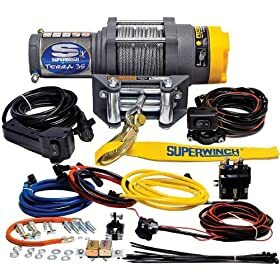 If you don’t have other towing accessories, or you want to avoid the high cost of towing your vehicle, you can choose this winch. 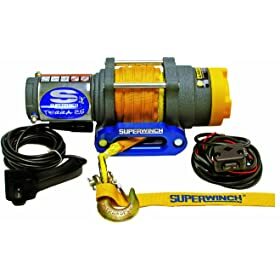 With this winch, you can simply call a friend who will save you from a frustrating situation. The package includes a mounting plate, roller fairlead, handheld remote and handlebar mount toggle. It is compatible with most mounting kits, so you will not have to purchase a special winch mounting kit. The steel drum can be used with a synthetic or cable rope. It has 1.3 horsepower permanent magnet motor for high efficiency. Your security is ensured when using the superwinch Terra 25. It has a dynamic brake and mechanical load holding. Also, there is a weather sealed solenoid contact and circuit breaker for extra security. Thus, cases of accidents are very rare when using this winch. You can use this winch in all weather conditions. A winch is a great tool for those who travel to tough terrains. Regardless of your vehicle model, ensure to carry a winch during your trips. The three winches in this review have been tested and they offer exceptional performance. Also, they fit most winch mounting kits.